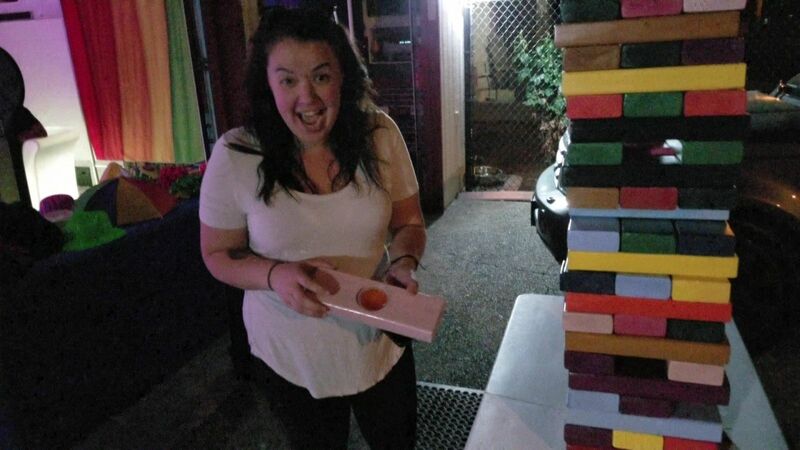 Jello Shots in a Giant Hardwood Game with colored blocks = lots of fun. Perfect for backyard events or any other party you can imagine. In this new version of a classic game, some of the blocks contain hidden spots for Jello Shots. Pull the block with the shot and it's yours! Who will be the one to make the tower fall? Who will get the most shots? Find out as you and your guests play this GIANT Hardwood Game Rental. Pull the blocks and try to keep the tower standing. Will you be the one to knock it down? Jello Shot Giant Hardwood Game Stacks to 5+ feet. The biggest hardwood game ever sold! Can stack to over 5 feet high in play! 54 Precision crafted polished hardwood blocks, each one nearly 15 times the volume of a Classic Block. Perfect for bachelor /bachelorette parties, weddings, ladies night out, reunions, graduations, indoor and outdoor events, etc.